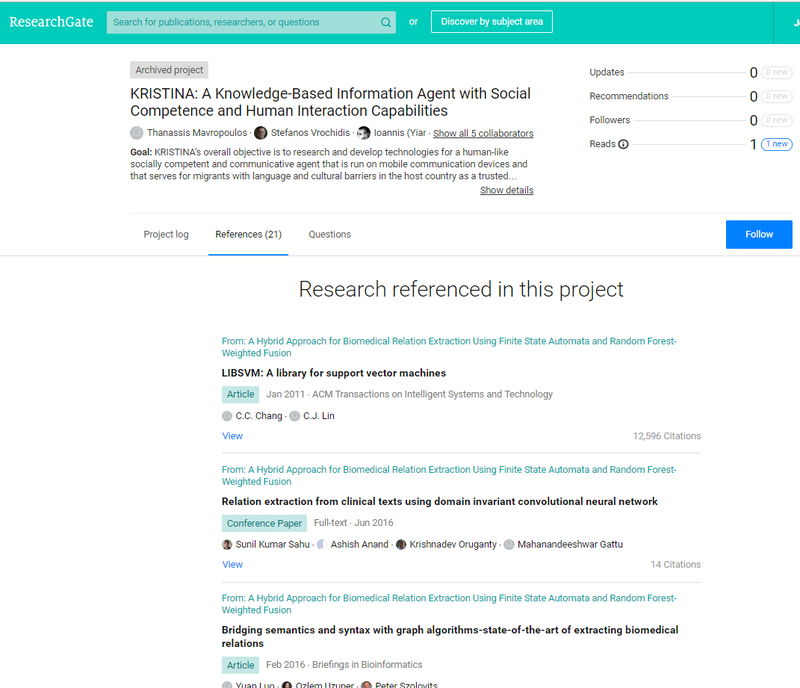 KRISTINA: A Knowledge-Based Information Agent with Social Competence and Human Interaction Capabilities, H2020 ICT, 2015-2018. KRISTINA’s overall objective is to research and develop technologies for a human-like socially competent and communicative agent that is run on mobile communication devices and that serves for migrants with language and cultural barriers in the host country as a trusted information provision party and mediator in questions related to basic care and healthcare. To develop such an agent, KRISTINA will advance the state of the art in dialogue management, multimodal (vocal, facial and gestural) communication analysis and multimodal communication. The technologies will be validated in two use cases, in which prolonged trials will be carried out for each prototype that marks the termination of a SW development cycle, with a representative number of migrants recruited as users from the migration circles identified as especially in need: elderly Turkish migrants and their relatives and short term Polish care giving personnel in Germany and North African migrants in Spain.